A field investigation into soil catenas in the Garraf Natural Park where the underlying rock type is limestone and where terra rossa soils predominate on east and south facing slopes. 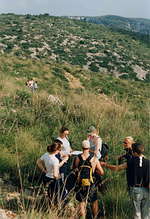 Comparisons are made of catenas on a variety of slopes. Aims include an understanding of the processes that operate within a soil that lead to its development. Human activity in the area has been dependent on soil quality and terracing has been attempted to improve the soil quality. � Soil depth will decrease as gradient increases. � Soil moisture will decrease as gradient increases. � Soil acidity will be highest where gradient is lowest and leaching predominates. Terra rossa soils will be found in these locations. � Human activity is influenced by soil quality. � Humans have attempted to improve the soil quality or prevent its further deterioration.